Firstly you should book your hotel well in advance to get a good choice and (hopefully) a good price. Look at a map and by the time you decide where to stay, you'll already have a rough idea of Venice's geography. Although it may spoil the fun of a holiday to plan everything first, with Venice it's good to have a idea of what to expect. Read up on how to get around and tourist attractions and discount cards and decide your priorities - - maybe you'll want to buy a travelcard or tourist card on arrival, or even in advance. We'd also advise you read our page on how to behave in Venice - the city is often up in arms over tourists' behaviour, even threatening fines and arrests, and not all of their rules are obvious. On this page we'll gather bits of practical information and advice that don't fit anywhere else on our site. Currently featured: postal services; currency; cashpoints; credit cards; chemists; mosquitoes; laundrettes. The Italian postal system can move surprisingly quickly - our record is a postcard sent from Venice which arrived in the UK two days later. Postage to the UK and the rest of Europe costs €0.65. Ask for "un francobollo per l'Inghilterra" / "due francobolli" ... etc. Don't forget to write the country (Inghilterra, Gran Bretagna, Stati Uniti etc.) You can buy stamps in most shops labelled as tabacchi. If you encounter the sort of shopkeeper who takes pleasure in refusing tourists, then head for the central Post Office by the Rialto, on Salizzada del Fontego dei Tedeschi. The queue at the kiosk for stamps isn't usually too long, you may get prettier stamps, and you'll have visited an interesting building into the bargain. The Fondaco dei Tedeschi was originally the base of German merchants; the present building was constructed at the beginning of the sixteenth century and was once decorated with frescoes by Titian and Giorgone. There are post boxes all around Venice (though never when you're looking for one!). 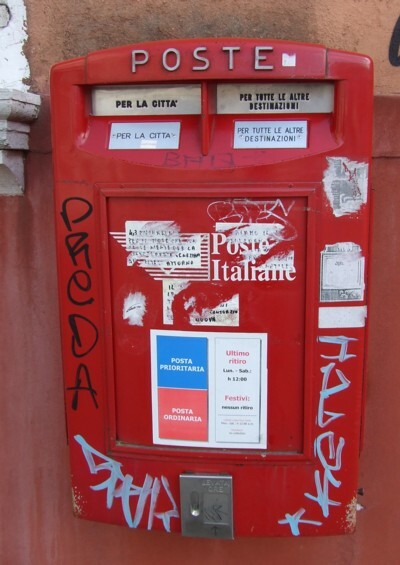 Normally there are two slots, 'Per la città' and 'Per tutte le altre destinazioni' - all mail that is destined to leave Venice must go in the latter one. The last collection on weekdays is at noon. For later collections visit the Rialto Post Office or the branch on the waterfront at Piazzale Roma, where the last collection is at 2pm. Post is transferred around the city on boats: if you (or your children) are intrigued by the practicalities of watery Venice, watch out for the 'Servizio Postale' boats travelling down the Grand Canal, moored alongside the central Post Office, or collecting post at noon (lie in wait by a post box, then follow the postman/woman). Italy's currency is the euro (pronounced ay-oo-ro), which is divided into 100 cents (centesimi). Locals complain that it has made life much more expensive since its introduction a few years ago. Maybe, but it's also much simpler to use than the nightmarishly-tiny lira, which forced tourists to cope with prices in thousands. Try to keep a range of small notes and a selection of coins in your wallet - shop staff have a resistance to giving change, and will often demand you give them ridiculous amounts of extra coins rather than simply do their job. Customer service here is not what foreigners are used to: staff are quite likely to be rude or simply throw up their hands and halt the transaction if you can't present them with denominations to their satisfaction. Cashpoints / ATMs can be found in strategic spots around Venice and outside most banks. They're called bancomat, and there's a choice of language menus. A standard UK 4-digit PIN works fine - if you have any doubts or you're from a country with a different format, consult your bank before travelling. You should also check your bank's policy on overseas transactions, as charges can be steep - for example £1.50 per transaction. The maximum you can withdraw is generally €250. When queuing for a bancomat you're expected to stand some distance away from the customer using the machine. Credit cards are accepted in Italy, though they are not used as widely as in other countries. Italians are not terribly trusting and prefer to pay in cash. Some small hotels or B&Bs, even in Venice, will insist you pay in cash - check with them before your departure time arrives. Sometimes shopkeepers have the cheek to ask for extra ID with a foreign credit card, despite the international logos of Mastercard/Visa/etc. We're not sure if this is a new law or just officiousness; in all our years in Rome we were only asked once, and we've never consented to show our passport. Increasingly you'll be asked to enter your 4-digit PIN (even the suspicous shopkeepers will accept this as an alternative to ID), sometimes you'll need to sign. In supermarkets the cashiers ask 'Bancomat o carta? ', as Italian banks have some system of cashpoint/debit-style payment. You can explain 'carta', or just wait for them to stick your card in their machine, when it should be obvious to them. A chemist's shop is called a farmacia, and they're identified by green crosses. You'll need to ask for what you want over the counter, so it helps if you take a dictionary. If there is any product you're likely to need which you'd find difficult or embarrassing to explain, take an old packet to Italy with you, or write down the full name to show the pharmacist. Venice's lagoon is infamous for its dreaded mosquitoes, zanzare. If you're prone to bites and visiting in summer take some insect repellent or a repelling device with you, or buy them in a local supermarket. All sorts of techniques are recommended for avoiding mosquito bites - taking vitamin tablets seems to help (apparently it's one of the B vitamins they don't like), although we're not sure about the green tea shower gel, and drinking tequila seems impractical. Pharmacists (see above) can supply some pretty powerful creams to treat bad bites (punture), although you can expect to pay at least €7. There are several laundrettes around Venice. We've used the self-service Speedy Wash laundrette on Rio Terà San Leonardo, near the San Marcuola vaporetto stop, which is efficiently impersonal, and open seven days a week (8am-10pm). 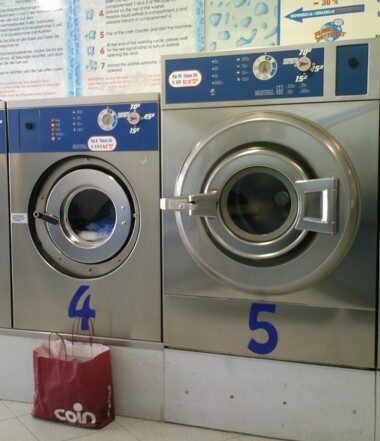 A normal-sized wash costs €6 and takes 35 minutes, and tumble-driers cost €3 for 15 minutes. The machine takes coins and uncreased €5 and €10 notes. Instructions are provided in a range of languages including English. There's a drinks machine and an internet cafe next door to keep you happy during the wait. Never be tempted to buy from the illegal street salesmen who clog up the tourist streets with their shoddy counterfeit goods laid out on a cloth. They are breaking the law - watch them sprint if the police approach. And so are you - if you buy from these criminals you too are liable for a massive fine, running into thousands of euros.